Once I got a good look at my visitor, it hit me! This was Mr. Chewy from the incredible pet delivery company, Chewy.com. I’ve seen him all over Blogville. He visits my sweetie Emma and always brings her the coolest goodies. She must have told him that I was her boyfriend. It seems this friendly pup is the representative of over 800 agents of awesomeness that work at Chewy’s. They are in warehouses all over the country to ensure some seriously fast shipping. I didn’t want to seem rude to my new buddy, but that box he had was emitting some pretty sweet scents. He must have noticed me drooling like a leaky faucet licking my lips. Smiling and giving me a wink, he handed me the box. We shook paws and he promised to come back and see me next month. I hurried into the living room with my box. Mom helped me open the box and we could not believe our eyes! Chewy.com knows how to say "hello!" Look at what Mr. Chewy gave me as a “hello” gift! 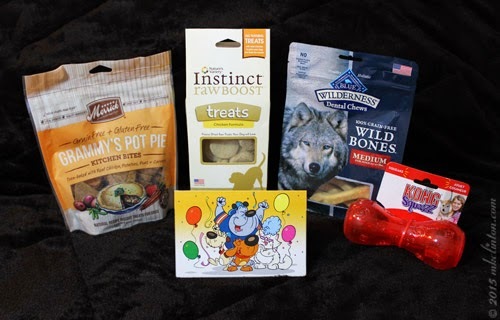 There is this Kong Squeezz toy, a bag of Blue Buffalo Wilderness Wild Bones Dental Chews, some of my favorite Merrick’s Grammy Pot Pie Treats, and a box of Nature’s Variety Instinct Raw Boost Chicken Treats. My tail was wagging so hard it is a wonder that I didn’t take flight! I was in complete treat mode until I heard mom’s squealing. It wasn’t like her to get THAT excited over treats, but I’ve seen her freaked over stranger things. This time though, I can’t blame her. The folks at Chewy.com sent her a painting of yours truly. 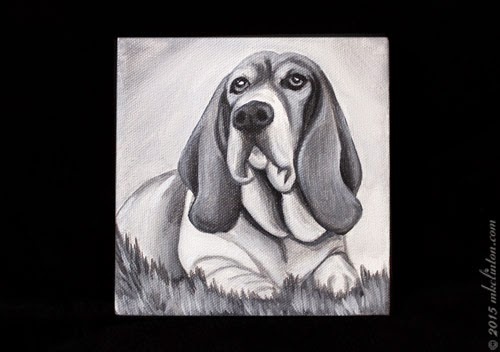 This great black and white portrait is from the talented Lauren Hammack of Off the Wall Paintings. I can’t wait to see what comes in next month’s Chewy.com box. 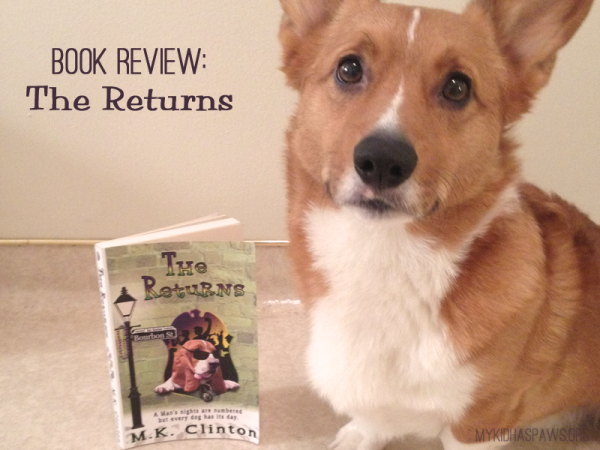 I want to give a special thank you to my friend, Rachel Sheppard for a great review of The Returns on her website, My Kid Has Paws. She also posted it on my Amazon review page! ♥ Both of these reviews mean so much. Stop by to visit and check out her thoughts. Dat looks like one pawsome dress! Pawsome portrait and enjoy all the goodies. Have a super Saturday. Wow, what a wonderful surprise for both you and your Mom, Bentley! Chewy is pretty awesome, isn't he? He always sends us the coolest things. 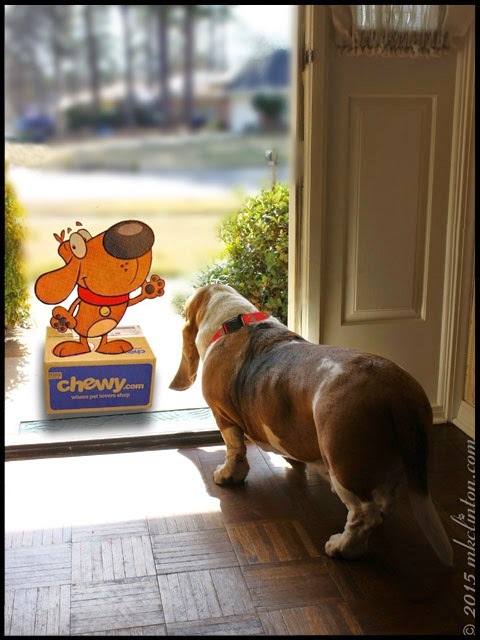 OMD OMD we are SO glad that you have JOINED THE CHEWY.COM FAMILY... We love them..
Oh wow!! That painting is so cool! We love chewy, too! Wow! That was really nice of Chewy. We don't think we ever got a hello gift from them. You scored and so did your mom, that is one beautiful painting Lauren did for you! What a gorgeous portrait!!! That Chewy is something else!!! Mom can't stop looking at ours! Enjoy!! How awesome! We have been using Chewy.com for Leroy prescription food ever since he got sick and they are one of the best companies that I have ever dealt with! I can't say enough good things about them.